The immediate past Deputy Vice-Chancellor (Academic) of the University of Ilorin and Professor of Animal Breeding and Genetics, Kolade Luke Ayorinde, has described as “unfortunate” the failure of the Federal Government to harness the potential of agriculture as a tool to drive the nation’s economy. 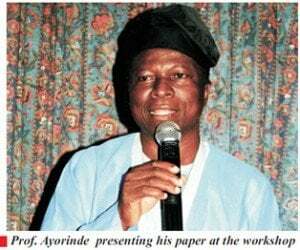 Prof. Ayorinde made the observation last Tuesday (June 17, 2014), in the lead paper he presented at the second Workshop of the Animal Science Association of Nigeria/Nigerian Institute of Animal Science (ASAN/NIAS), which was held at the Kwara Hotels & Towers, Ilorin. The theme of the Workshop was “Animal Improvement for Profit Maximisation”. In his paper, entitled “Knowledge of Genetics: A Pivotal Strategic Asset for Optimising Productivity and Profitability of Animal Production”, the renowned agriculturist explained that “despite all our knowledge, despite all our potentials, we have not harnessed potentials in agriculture enough and are unable to manage what we have. We depend on others and prefer foreign approaches to our indigenous alternatives. We appreciate what we don’t have and ignore our gifts and talents”. The Guest Speaker noted that if Nigeria is able to get her youths to embrace agriculture, “there is no way they will not make abundant food for themselves, which is helpful to the economy of the state and the nation”. The don disclosed that the knowledge of Genetics has led to the application of improved methods of breeding, feeding, management, and disease control to increase efficiency and profitability of livestock production. According to Prof. Ayorinde, “breeding methods and practices of the past have accomplished a great deal, giving farmers the fine breeds of livestock we have today”. He added, “We should hold on to the gains that have been made so that current adoption of new technologies in the breeding of various classes of livestock for further improvement does not completely erode past gains”. Prof. Ayorinde noted that the livestock sector in the country is often said to be a sector of unfulfilled potential due to its dismal contribution to the country’s Gross Domestic Product (GDP) as well as its inability to meet the nutritional needs of the populace. He, however, pointed out that “nowadays, biotechnology or genetic engineering is assisting breeding programmes globally to make rapid and significant breakthroughs because all life speaks the same language”. The Guest Speaker said that Molecular Biology or Biotechnology has become well-established in supporting the economies of developed countries, but remains largely untapped in Nigeria, as there has not been much application of this promising field of genetics to livestock production in the country. He however urged the government to make efforts to create awareness and avenues whereby the benefits of the new findings can reach the farmers. Other papers presented at the Workshop included, ‘‘Profitable Grass-cutter Farming: A possibility in Nigeria Environment” by Mr. Femi Ojedoye, “Effective Management of Laying Birds for Profit Maximisation” by Mrs Mubo Ojuawo, “Bench Mark Feed” by Dr. S. A. Bolu, and “The Use of Selection and Crossing for Improving Productivity of Herds and Flocks” by Prof. K. L. Ayorinde. In their welcome addresses, the Chairman of the Animal Science Association of Nigeria/Nigerian Institute of Animal Science (ASAN/NIAS), Kwara State Chapter, Prof. M. A. Belewu, and the Chairman of the Workshop Organising Committee, Dr. A. A. Toye, said that the workshop was designed to apply systematic approaches to the delivery of solution to development needs in ways that positively transform agricultural productivity in the immediate and long term. The event also featured the presentation of prizes to the winners of the 1st Animal Science Inter-Schools Quiz Competition sponsored by the Kwara State Chairman of ASAN/NIAS, Prof. Belewu, of the University of Ilorin.